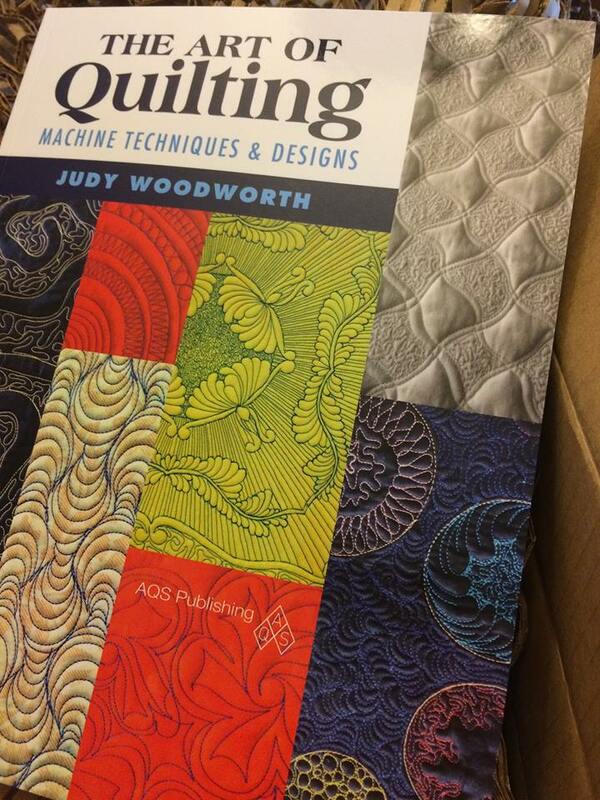 Judy Woodworth has a new book published, and releasing now. I believe this is her third. She has been so gracious as to send me a copy and I want to give my thoughts on this. In a day and age where quilters are flocking to the classes of the new, more modern quilters (no names, but you know who they are), I want to remind you of another. Judy has been in this business as long as some of these younger quilters have been around. She's delightfully old-fashioned, down-to-earth, and generous in her knowledge. I have taken at least 3 classes from her, and as somebody that has sat through lots of different classes, if you are a long arm quilter, Judy's are very informative. She makes quilters of every single ability feel welcome, and educated. If I weren't busy trying to teach my own classes, I'd probably still be taking her's! 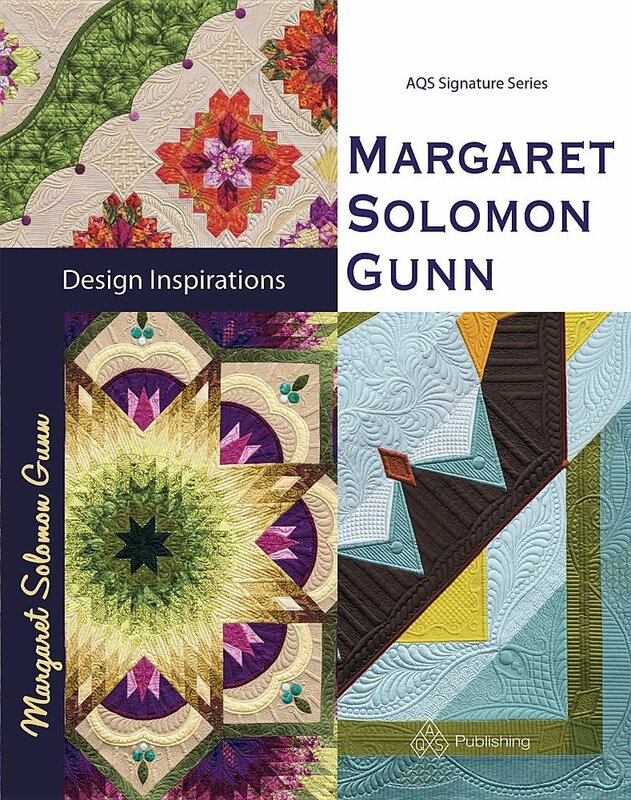 So she's got a new book out which I feel is a culmination of her years of quilting. 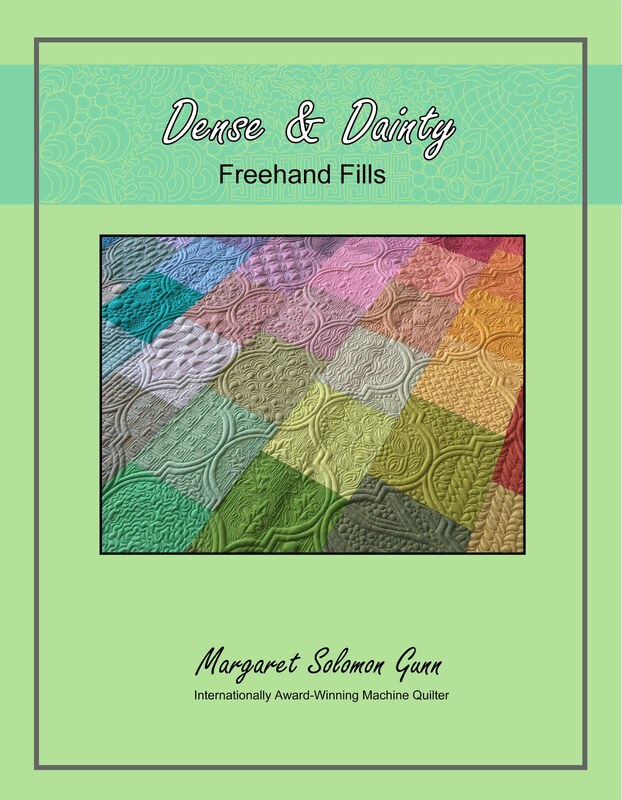 It is summarizes her "school of hard knocks", giving new quilters the benefit of some of the mistakes a seasoned quilter makes. Her book is a mix of many things. 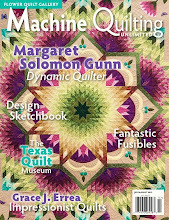 The beginning outlines many, many tips for quilters from battings, to backing fabrics, to you name it. 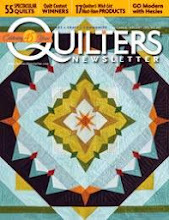 If you are a newby quilter, there are plenty of great tips in there for you. 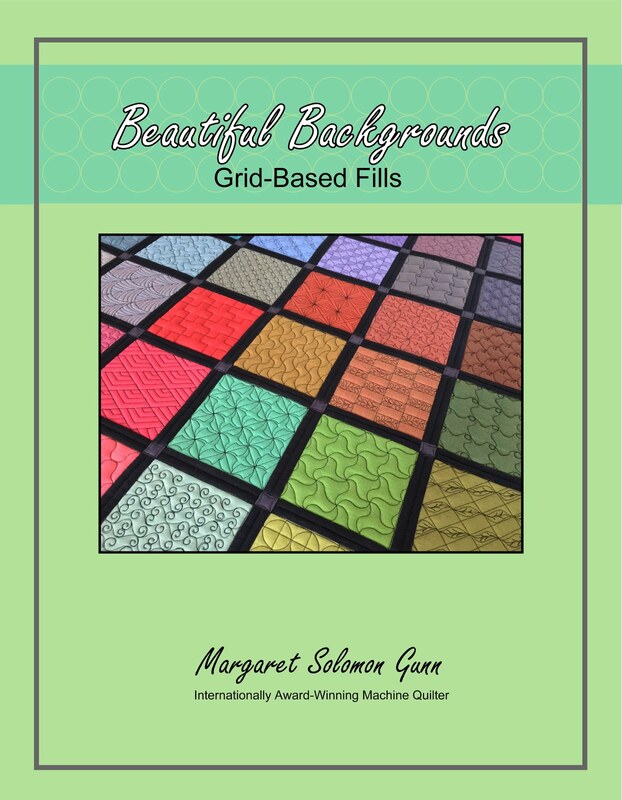 The more seasoned quilter will greatly appreciate the many quilting photos and sketches in the book. Judy is known for her very organic-style of free-motion quilting, and there are many sketches like the next ones, with the actual quilting photos beside the sketch. 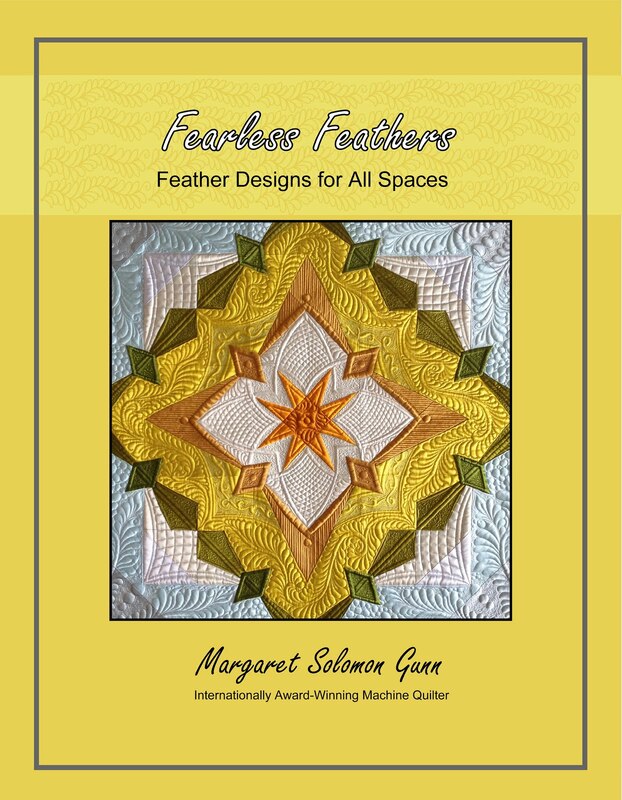 The book is colorful with photos of basic quilting motifs, as well as shots from her award-winning quilts. My favorite section is at the end of the book. 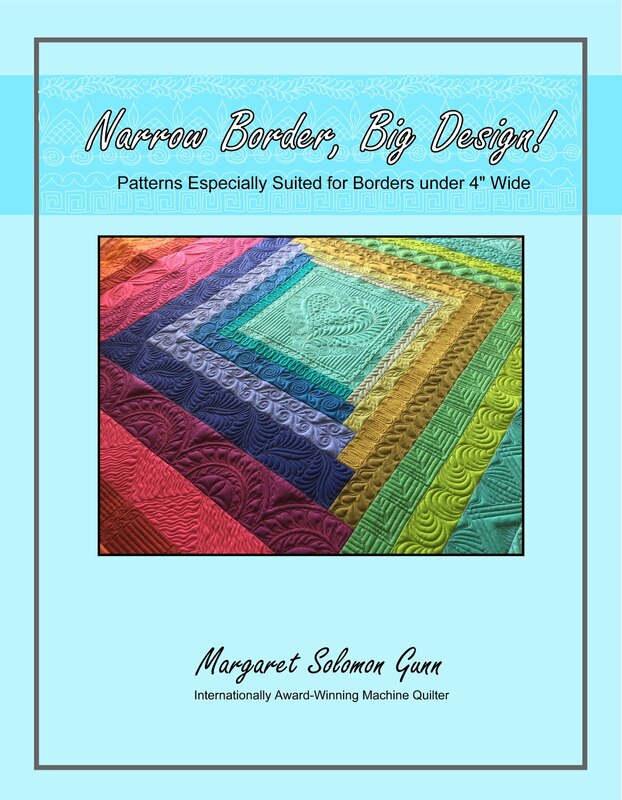 This is definitely geared more for the experienced or intermediate quilter, but that is why I said that this book is really for all audiences. Now, you all know I am a symmetry freak, but I think I like this because it is unique. I have not seen another book with what are basically whole cloth motifs. There are a dozen or more symmetrical designs, showing you what it would look like as a triangle sketch, and then projecting it 8 times to the full pattern. They are great! If you get a chance to get the book (it is published by AQS) you will agree that there is much inside! Also, I heard that Judy will be teaching in October at MQX MidWest (as will I!!). If you can attend the show, you can experience her classes and expertise first hand! This is the end of vacation week for my kids. Everyone has been home bored out of their minds - you know how the drill always is. But this was a dedicated few days that I had my machine vacant, and my daughter home. We had a mission that needed accomplishing - this quilt had to be quilted. This is her quilt. She's nine, and she did most of the piecing of this late last fall - with a Janome machine she won by entering a quilt at VQF. You're thinking, these are not my colors...Bingo. She shopped for and selected the fabrics. Ironic that she chose that Michael Miller Eiffel tower fabric again this year! Scroll way down on this link and you will see what she quilted last year. Every year, she gravitates towards the solid fabrics, and they are always a constant challenge to quilt. On Sunday, her quilt and a sample piece of fabric was loaded. I had no idea what she'd quilt on her pink & green quilt. Last year's quilt was such a nice clean finish. The parallel (mostly) lines were neat, and they looked professional. They were also done with the channel-locks. It was not computerized quilting, but it's a little beyond free-hand also. This year, I wanted her to try something more, something different. Two years ago, her butterfly quilt was quilted with a panto from the backside of the machine. These butterflies were a wee bit wonky, but she was pleased. It was worth another try. She was taller now, which would make this easier. Here was the flower panto I pulled. I do have a few that are easier, but didn't think they related to her "Springtime in Paris" notion. The panto was really hard. Really!...She quilted a good 80" of it, and there is barely a resemblance of a flower. We needed plan B. It was time to go to the front of the machine so she could try quilting things she could see, rather than the red laser. There were bumps, and some letters. What kid won't try quilting their name? I tried drawing a flower and having her quilt over it. She's too literal, and tries to trace the line exactly. It ends up being very messy. What she really needs is 10 yards of fabric to just PLAY. Then she'll get the feel of the machine more. Unfortunately, we didn't have that kind of time. As a last resort, I remembered that the machine handles horizontal and vertical lines very easily. Have her try boxes, and a boxing path. I actually thought I might have her do this in the busy part of her blocks, and the channel-lock lines everywhere else, as that would have a very clean finish, but she chose this pattern for everywhere. This is her quilt, and her learnings. I am glad to have her quilting from the front-side and quilting free-handed. That is a huge step over the last 2 years, even if she never wins anything with this quilt. She's still tiny so the step stool was needed to get her hips up to the belly-bar. The pattern quilts slowly so it's mostly standing on one place. Over the course of 4 days, we got through this twin bed quilt. By "We", I mean "she". I got to clean the studio and repeat "stop racing" and "sharp corners" about a zillon times. I tried using a silk batting that Hobbs sent me last fall. I thought I might use it for myself, but her's has a flannel backing, and a thinner batting would be a good idea. It's nice. It's hard broaching the "you may not win" discussion with a 9-year old, after she's won 2nd and 1st place in the past 2 years. She's got her eye on the money. Or so I thought...She told me she really wants the sign that MQX puts by the winning quilt that says "1st place"! Chuckle! But seriously, though I know it is healthy for kids to learn how to not win, she just lights up when she does. It has been immensely motivating in keeping her wanting to continue sewing and quilting. Here's her finished quilt, quilted in a fantastic lime green thread. It is boxy, and has a crackle-like texture. It's all free-hand from the front-side, wonky and 9-yr old at the same time. Hopefully the judges will recognize the 8 hours it took her to quilt it. They don't care that she chose the fabrics, and pieced it herself. They only judge the quilting part. I know it's errors. It's not like my quilts where some of them can be hidden. The solid fabrics show it all. In the end, it does not matter. She loves the quilt, and is proud of having made it. Sophie was ready to have it on her bed 3 days ago, before the binding is even stitched. Some poor sap is hand stitching that for her (seriously, THAT is on my list of "need to teach her" for next year!). A huge thank you to everyone that helped to clear my studio last week by purchasing my half-made things and fabrics. All but 2 shipments went out on Saturday. There is still a lap quilt and some canvas for sale if anybody is interested. Yesterday, I pulled spools and cones of thread that I may have won or decided after purchasing that I don't like. Please email fast at msolomo1@maine.rr.com if you are interested in anything! Payment via paypal please. When I know what you want, I will work out cost-effective shipping. Domestic only. I will be in and out today, but email a message if you are interested!! So, rather than be productive today (where's the fun in that?! ), I decided it was clean-the-studio-out day! My fabric storage is out of control, and messy too. I have a vicious habit of hoarding absolutely everything - just look at this piece that has fussy-cut hexies cut from it, This was used on Bouquet Royale. Do you really think I will use the rest of the fabric?! I went through every stack of fabric, pulling out those that I know I won't use. I applied that "cleaning the closet" rule we all hear. If you haven't worn it in 12 months, toss it. Mine was more like "if you don't think you'll use it in 5 years, maybe toss it". The toss table got much fuller than this. The upshot of my cleaning (I have fabric coming to start a new quilt...gotta make room! ), is that I get to have a little sale. I have some gadgets, some fabric, and some partially constructed goodies that really just need a new home. Please email msolomo1@maine.rr.com if there is anything you'd like. I will combine shipping if possible if you want more than one item. Paypal if possible. You all probably know I am a template junkie. I cleaned out 4 that I don't use often enough. Some are decent sized yardage; ones on right are good sized, assorted scraps. brown (was a wide backing) 29"x96"
You may also have these teeny-tiny 1/2" pieced mosaic strips. There are eight at 2-1/2" x 26"
This is an unfinished delectable mountains quilt, finished size 68"x68". Fabrics are red, green ablack and beige, but not necessarily holiday-like.Includes pattern, and fabrics. Many pieces are stitched; all are cut. Bag on left is all 2" HST's that need to be pressed. Red yardage may be for binding or extending the border. Two pieces are 21"x48" and 42"x64". $30 plus $8 ship. This entails 17 strips of a fun jelly roll. I no longer know the pattern. $8 plus $2.50 ship. These 24 12-1/2" blocks (4 blocks shown below) were made a few years ago as part of a quilt block swap. A couple of the blocks need mending. These are all pieced, and were intended to be a simple alternative to the appliqued tea-leaf pattern. This mostly finished, original 38"square quilt is all silk dupioni. I started this in 2012-2013. The appliqued edges are not yet stitched, and there is still foundation paper under them. All fabrics are interfaced. Piecing on the quilt is generally very good, although this was my first opportunity stitching interfaced silk. While I like the quilt, I just don't see myself finishing it anytime soon. These were purchased last year off of ebay at a time when I wanted to make a vintage quilt for an article. When I decided I didn't want to write the article, I no longer needed the blocks. Each hand-pieced block is made of 4 smaller bow-ties. Note that the hand piecing is not perfect. $12 plus $5 ship. Now I have several offerings of fabric. Many of these are of varying sizes. I will indicate if there is yardage, as opposed to FQ or scrap size. If you are a charity quilter, or like making scrap quilts, BOY have I got a load of goodies for you! 4-1/2pounds of brown!...at least 8 FQ, four at 1/2yd, 5 at 3/8 yd and more. Estimated 6 yards. $25 plus $12 flat rate ship box. Allshown in next 2 photos $20 plus flat rate $12 box ship. 4lb of mixed stuff. There's at least 6 FQ, blue letter print is over 1/2yd. pirate fabric is 1yd, others are 3/8 to 1/2yd each. This is left over from my Kaleidoscopic Calamity quilt, which was made 3 years ago. All pieces are 1/4 to 3/8yd each or so. $12 plus $5 ship. 2-3/4lb of fabrics, with largest pieces 1/2yd. There are about 8 FQ size, 6-8 at 3/8yd and at least 3 that are 1/2yd. Estimated 6 yards. $17 plus 8 ship. Clearly this is the largest, as I love green. 6 lb of green fabric. Several pieces are ~1/2 yd. There are about 6-8 FQ size, two bags of mixed sizes. These two are 1 and 2 yards, respectively. Total for all green is $36 plus $15 ship flat rate. This is a 2 yd piece of beach panels. Pieces in next photo in total exceed 2 yd. $15 plus $6 ship. $50 plus $12 ship. This is made from quilt-shop quality cotton quilting fabrics. It has a cotton batting, and hand stitched binding. The quilting is a simpler edge-to-edge. It would be perfect for a grandma that has several grandkids! OK, there you have it. Please email me at msolomo1@maine.rr.com if there is anything you would like. I will accept paypal as payment, or personal check if I know you.